It’s all too easy to conjure up romantic images about this style of cooking – Cacciatore – “Hunter’s Style“. A few friends, close relatives, maybe, up in the mountains, deep in a forest, on a weekend hunting trip, taking a few provisions with them – a little oil, a few dried herbs, a couple of bottles of wine, and then retiring to a log cabin at the end of a successful day to put together a simple meal based on the day’s catch and a few foraged wild mushrooms. This entry was posted in Food Diary, Recipes and tagged cacciatore, chicken, Italian, paleo, recipe on January 15, 2015 by paleovirtus. I’ve had my eye on this one for some time now. It’s a dish we used to eat quite regularly once upon a time – partly cooked spaghetti, finished off in olive oil infused with the flavours of garlic, chilli flakes, and parsley. It’s ridiculously simple, not to mention quick, to prep and cook – if you get your act together, you can easily go from fridge / cupboards to the dining room table in under a quarter of an hour. 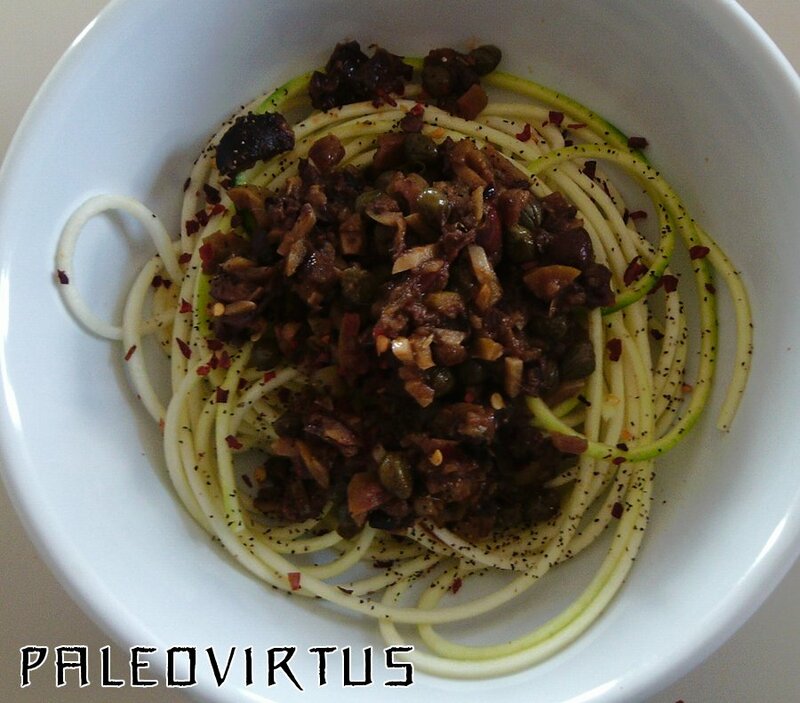 This entry was posted in Food Diary, Recipes and tagged chilli, garlic, Italian, olive oil, paleo, parsley, recipe, spaghetti, zucchini on December 21, 2014 by paleovirtus. This was Paleovirtus Jr.’s somewhat less than subtle way of alerting me to the fact that our local hypermarket now do an own-brand pork sausage that boasts a high meat content (90%), and is also potato flour and dextrose free. Apart from the pig, these sausages contain only water, salt, and herbs and spices (black pepper, rosemary, marjoram, basil, and coriander), as well as small amounts of the usual antioxidant and preservative type additives. I will not buy a sausage that has been padded out with all manner of sugary and floury crap, but I’m prepared to make an occasional exception for certain substances put in place to prevent my food from accidentally killing me. This entry was posted in Food Diary, Recipes and tagged casserole, Italian, paleo, recipe, Salsiccia, Sauerkraut, sausages on November 13, 2014 by paleovirtus. Regular readers of this blog might have come to the conclusion that over at Château Paleovirtus we quite like Indian food. Bit of an understatement, actually, that. We flipping well adore Indian food! We also firmly believe that you can have too much of a good thing. Chalk one up for being brought up Lutheran / Methodist. This entry was posted in Food Diary, Recipes and tagged courgette, Italian, paleo, parsley, pesto, recipe, squash, walnut, zucchini on October 23, 2014 by paleovirtus. I love this dish – all those earthy, pungent, salty flavours. This makes for a super-quick and easy lunch or supper, a true chop, chuck, stir and serve job, ready in under half an hour if you play your cards right. Add to that the ease, convenience, and flavour of zucchini / courgette spaghetti, and you’re on a real winner. A good bowlful of zucchini / courgette spaghetti. I prepared the ones I used for this particular meal with my new Westmark Spiromat. Heat 2 tbsp of olive oil over medium-low heat in a non-stick frying pan. Gently fry the onion until starting to soften, about 5 minutes or so. Add the anchovies, and fry for a further 5 minutes. Add the garlic, and continue to fry for a further 5 minutes. Add the Herbes De Provence and the smoked Spanish paprika. Fry for a further 2 or 3 minutes, adding a little water to the pan if things start to stick. Add the olives and capers to the pan. Mix well, and cook for 5 minutes or so. 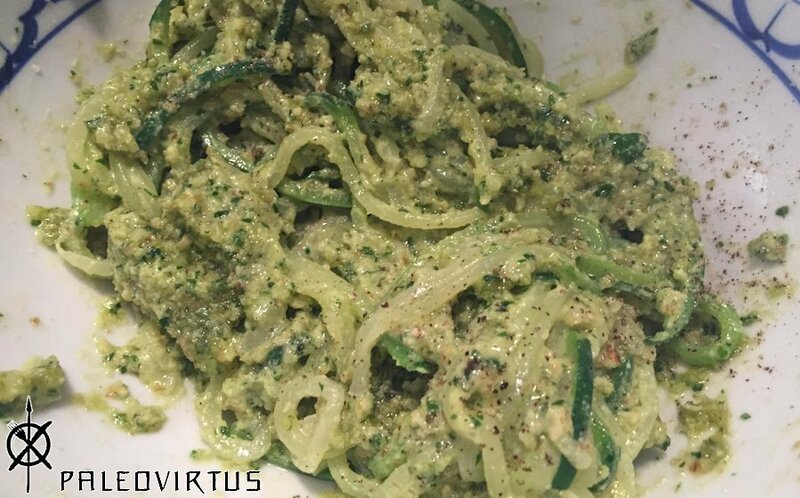 Serve over the zucchini spaghetti, dressing with black pepper, hot chilli flakes, and fresh lemon juice to taste. This entry was posted in Food Diary, Recipes and tagged courgette, Italian, paleo, puttanesca, recipe, spaghetti, squash, zucchini on September 25, 2014 by paleovirtus.